Funke Akindele’s husband, JJC Skillz’s first baby mama, Taiye Fajemisin Adeyemi, has just welcomed a new child with her husband in U.K. 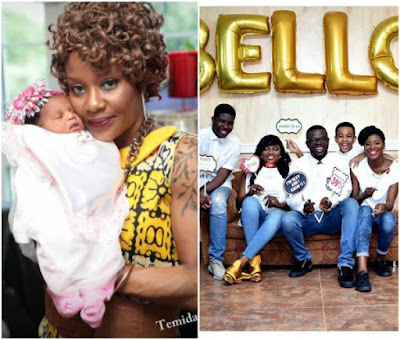 The baby who arrived two days ago, has already been christened Jasmine Dolapo Opeoluwa Adeyemi by Tamara Bello’s mum and her husband Adeyemi. JJC who has long married Jenifa’s diary star actress and producer, Funke Akindele, also has two other sons with other baby mamas.